What’s Up with Cancer Staging? M= has the cancer metastasized? Meaning has it spread to another part of the body. A big part of oncology residency is memorizing staging (I still have that stack of flashcards somewhere). However, as of January of this year, everything changed. Cancer staging is now so complex, doctors often need to enter multiple pieces of information into the computer before the stage can be calculated. Consequently, you may have been told you had a Stage I breast cancer, only to find out it now is a Stage IIB. Here is why…. Previously, if a woman underwent surgery and was found to have a small tumor, with negative lymph nodes, she received a Stage I diagnosis. Stage I breast cancer has cure rates over 90% with appropriate surgery and radiation. However, we now understand that it’s not just the size of the tumor or the number of lymph nodes that matter when looking at cure rates, it’s the breast cancer subtype. Research has shown that even with a small tumor and negative lymph nodes, the subtype tells us how the breast cancer is going to behave. Some breast cancers, like “triple negative breast cancer” or “Her2 positive” can act aggressively and travel to the bones or liver. These cancers need chemotherapy first to ensure that any cancer cells circulating through the bloodstream are destroyed prior to treating the breast with surgery and radiation. In summary, cancer staging was updated in January 2018 to reflect our current understanding of the biology of the cancer. With the advances in screening and imaging, many tumors are detected early, while they are still small. However, even small tumors, with a certain subtype, can misbehave and require more aggressive treatment. Your oncologist may also send your tumor for genetic testing. This test will not look at your genes, but that of the tumor. The genetic testing may identify a specific mutation, or “target”, that one of the newer drugs can treat with minimal side effects. How do I Find Out My Cancer Stage? My advice is to simply ask your oncologist if you are confused about your stage of the disease. They should be able to explain your specific cancer stage and the implications. Remember that your cancer is as individual and unique as your fingerprint, and our treatment plans are too. While the stage is important, the tumor biology (subtype), your overall health, and your response to treatment will ultimately determine the outcome. 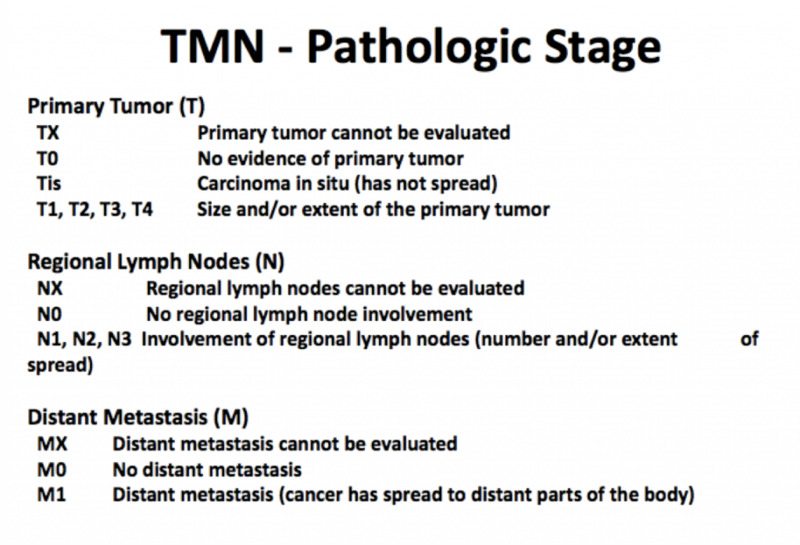 For more specific information, check out this resource on Cancer Staging.